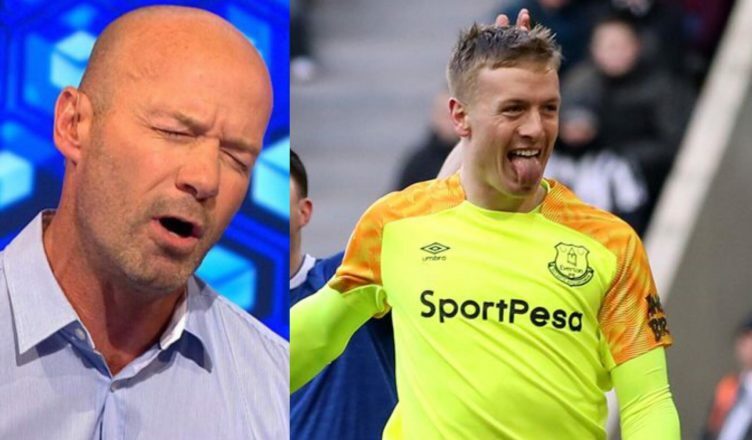 Alan Shearer sends brutal message to Everton’s Jordan Pickford – “It’s ridiculous & bizarre” – NUFC blog – Newcastle United blog – NUFC Fixtures, News and Forum. Alan Shearer has slated Jordan Pickford’s ‘ridiculous’ and ‘bizarre’ approach to Saturday’s game – telling him he should be more focused on keeping balls out of his net that goading Newcastle fans. Shearer is known for his brutally honest punditry and will of course also take extra glee with this one, as Newcastle came from behind to secure a massive three points at St.James’ Park. ‘I WAS at Newcastle to watch a very strange performance from England keeper Jordan Pickford. In fact, it was stupid at times. ‘He should have been sent off for his rugby tackle on Salomon Rondon and I’m still not sure why he wasn’t. ‘But he simply got carried away and involved in things he shouldn’t have been. He let the crowd and occasion get to him. Pickford should know as an ex-Sunderland player he will get stick from Newcastle fans. But then he wants to get involved with gestures and smiles. ‘It’s a ridiculous and bizarre way of behaving when he should be focusing on keeping the ball out. ‘I’m worried for him England wise now. He was outstanding at the World Cup in Russia and should be making the shirt his. ‘But even basic saves he tries to make look spectacular. Everything seems to be an issue. Pickford has rightly came in for stick from his own Everton fans for this antics at the weekend – as another poor display continued what has been a very underwhelming season for him personally so far. It was a show of immaturity and regardless if it is Newcastle, Pickford has to be better than that. Or, giving the the fans stick has to come from a good performance, you can’t behave like that when you are having a shocker. Footage even emerged after the whistle of Pickford shouting at Newcastle fans. Add to this that Sunderland fans were reportedly chanting during their own league game (in League 1!) about Pickford saving a penalty against us and it really does hit home of how much Newcastle United seems to pre-occupy the thoughts of Sunderland. Pickford would be wise to take the advice of Shearer and focus on delivering on the pitch. If these new Rondon reports are true, we better pray West Brom don’t get promoted.. The fact that you had to add a sentence saying how preoccupied Sunderland is with us only makes it look like it’s you that is obsessed. When you are the bigger man/person/club you don’t need to acknowledge every little thing. Or the fact you had to leave a post, pointing out that he had to make a comment that you’re obsessed with us, proving we’re obsessed with you, proves that you’re obsessed with us being obsessed with you? This could go on a while eh?